If you need to have a long piece of text without spaces it may not look good as the browser cannot wrap the text when it gets to the end of the line. Although long words are unlikely you might have a very long url such as http://www.whatalonglinkihaveonmyserver.com/notjusttheservername/butthesefoldersaswell/andlaterthereislotsofgetdata/mypagenameisstupidaswell.php?somevaluesarebestforgotten=true&othervaluesshouldbenamedmoreconisely=true or you might just want to join words together to convey emotion such as if someone in a story walked into a room and saw something shocking and shouted "WhatareyoudoingtherewithmypajamasonandthatrattlesnakeandourremotecontrolpickupnevermindwhatlookslikethreethousandorfourthousandcopiesoftheHTMLstandardsprintedoutandboundinpinkleather?" Hopefully your browser coped with the long URL by breaking it at a slash or other symbol but the text should look pretty bad. 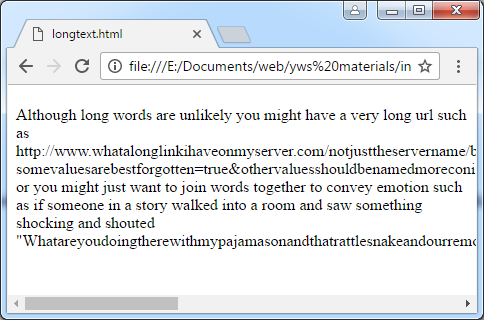 Although long words are unlikely you might have a very long url such as http://www.whatalonglinkihaveonmyserver.com/<wbr>notjusttheservername/<wbr>butthesefoldersaswell/<wbr>andlaterthereislotsofgetdata/<wbr>mypagenameisstupidaswell.php<wbr>?somevaluesarebestforgotten=true<wbr>&othervaluesshouldbenamedmoreconisely=true or you might just want to join words together to convey emotion such as if someone in a story walked into a room and saw something shocking and shouted "What<wbr>are<wbr>you<wbr>doing<wbr>there<wbr>with<wbr>my<wbr>pajamas<wbr>on<wbr>and<wbr>that<wbr>rattlesnake<wbr>and<wbr>our<wbr>remote<wbr>control<wbr>pickup<wbr>never<wbr>mind<wbr>what<wbr>looks<wbr>like<wbr>three<wbr>thousand<wbr>or<wbr>four<wbr>thousand<wbr>copies<wbr>of<wbr>the<wbr>HTML<wbr>standards<wbr>printed<wbr>out<wbr>and<wbr>bound<wbr>in<wbr>pink<wbr>leather?" Try it. It may not be perfect but should be slightly better.